He takes risks. He seeks results. 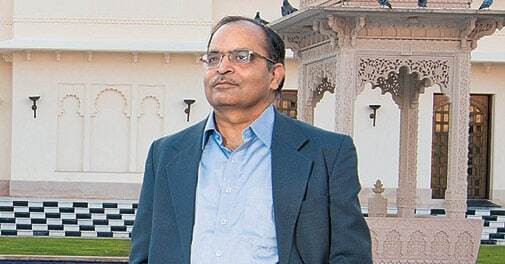 Akhilesh Joshi has played a stellar role in the success of Hindustan Zinc. It is October 27, 1986. A motley group of mining engineers from Hindustan Zinc, then a public sector manufacturer of zinc, lead and silver, is at work deep inside the company's Mochia underground mines near Udaipur in Rajasthan. It is about to finish a project begun three years before. But the task at hand is a complex one, called "pillar blasting" - it is a job being attempted for the first time in India and the biggest such effort in Asia as well. When an underground mine is worked on, large pillars are deliberately left standing - unmined - to give stability to the structure. But these pillars too have rich ore. One means of increasing the productivity of a mine in its later stages is to blast some of these pillars and extract the ore. But this must be done without causing the mine's collapse. The atmosphere at the project site and in the company's corporate office at Udaipur is tense but calm. The project leader, a 32-year-old mining engineer, carries out the final checks. His responsibility is immense. The Mochia mine lies beneath a mountain and an imprecise blast also risks sinking the mountain into the mine, leading to huge losses of life and property. But Akhilesh Joshi, the project leader, has been fine tuning the position and depth of the holes that will be drilled to place the explosives, the type and amount of explosive to be placed in them, and the timing and sequence of the blasts for three years now. The detonation is carried out. A series of rapid explosions rock the mine sending reverberations kilometres away. As the dust settles, it becomes clear that the effort is a success - the identified pillars have been blasted but more importantly, the mountain has not caved in. The mine structure remains intact. This success gave Hindustan Zinc a breathing space of five years to augment its mining capacity. It also established young Joshi as a star employee destined for a larger future role. Today, 28 years later, he is the CEO of Hindustan Zinc, which is also one of the largest zinc producing companies in the world. "A strong appetite for risk, the willingness to adopt innovation, the ability to plan meticulously, build a strong project team and give its members operational freedom to deliver were traits Joshi exhibited fairly early in his career," says R.R. Kumar, Vice President (Mine Planning), Rampura Agucha Underground Mine Project of Hindustan Zinc. Kumar had been handpicked by Joshi to be part of the Mochia pillar blasting project in 1986. What makes Joshi's success all the more significant is that he has managed to effortlessly cross the public sector-private sector divide. He first proved his worth when Hindustan Zinc was a public sector unit. But after the Vedanta Group took over the company following its divestment in 2002, he impressed his private sector employers too with his expertise. He became the chief operating officer of the company in 2008 and the CEO in 2010. Hindustan Zinc caught Joshi's fancy fairly early in his life. "I chose to do BE (Mining) at a local engineering college and overlooked two other plum jobs to become the assistant mining engineer at Hindustan Zinc's Zawar mines (near Udaipur)," he says. A dearth of mining engineers those days meant youngsters like Joshi had lots of opportunities to learn and test their leadership skills. "Bosses did not teach those days. You learnt from handson experience and from the workers you managed," adds Joshi. He soon began to dream of becoming the head of the company's mining operations one day. "Though Hindustan Zinc was a public sector company, the culture inside was like that at any private sector company. Good performance was encouraged and rewarded," he says. This helped. After the success of the Mochia pillar blasting project, he was put in charge of the company's Rajpura Dariba mines. A few days before he was to take over, a major accident in the mines led to many deaths and the mine was shut indefinitely. "It took us two months to pull out the bodies of our colleagues," he says. Joshi put the disaster quickly behind him and restarted the mine in record time. This too earned him a promotion. He was made head of mining operations at Rampura Agucha mine, a large open cast mine that accounts for over 75 per cent of the Hindustan Zinc's ore needs. After the Vedanta Group took control of the company its immediate priority was to increase the output of the Rampura Agucha mine. A PSU engineering consultancy company had suggested a plan which involved investing a few hundred crore to raise the capacity of the mines from 1.35 million tonnes to two million tonnes. Joshi managed to do so at a cost of just Rs 5 crore by streamlining operations. He increased ore recovery levels to 90 per cent from 88 per cent and cut the cost of excavation from Rs 50 per tonne to Rs 36 per tonne. "Today Rampura Agucha is the benchmark mine in the world when it comes to zinc production," adds Kumar. Joshi revels in proving others wrong. An Australian consultancy firm had said that the maximum capacity the Rampura Agucha mine could deliver was five million tonnes. "Joshi built the manpower, bought large, modern equipment, brought in technical expertise and raised the capacity to 6.1 million tonnes by 2010/11," says Kabir Ghosh, Head, Technical (Mining), who had joined Hindustan Zinc around the same time as Joshi. "He loves to take up challenges and has the technical expertise and people skills to deliver results. He is not a good orator but is a great communicator." Indeed, Joshi continues to take up fresh challenges. He intends to increase the company's annual ore output to 15 million tonnes in the next five years from the current 10 million tonnes by focusing on underground mining. Hindustan Zinc's Rampura Agucha mine, now the largest open cast zinc-lead mine in the world, is slowly becoming unviable. "We will, over time, convert it into an underground mine," he says. The success of this venture will have a big impact on the future of the company. He is already working towards the expansion of mining activities by investing heavily in exploration. Hindustan Zinc's annual spend on exploration is Rs 50 crore and this is paying dividends. Around the time of divestment the identified ore reserves of the company stood at 143.7 million tonnes. Today it is in excess of 315 million tonnes. Joshi's networking ability both within the company and outside is another strength. His colleagues describe him as a result-oriented leader, but one who rarely displays aggression. He delegates and waits for results. He says his mother, Geeta Joshi, has had the greatest influence on him. "Her words 'You will achieve what you think' is a mantra that I have followed through my career," he says. It has worked well for him. He wanted to join Hindustan Zinc and did so. He wanted to head its mining operations and did so too. However, becoming the CEO of the company was not something he had expected. The management bet on him and is reaping the benefits. Under his watch, Hindustan Zinc's revenues have grown from Rs 8,134 crore in 2009/10 to Rs 12,700 crore in 2012/13 and net profit in the same period has risen from Rs 4,041 crore to Rs 6,899 crore. Clearly, Joshi has had plenty to write home about.